Sylvia Klein, one of the founding members of AMI, spoke at the Annual General Meeting in honour of the 35th Anniversary. Read her speech here. Up to 1990, AMI-Québec was operating with volunteers only and with no secured budget. Programs included a monthly support group and a monthly information session. A quarterly newsletter was published for members. AMI-Québec has evolved to become one of the principal resources in Quebec for families struggling to cope with mental illness. It has also become an important promoter of recovery-based care, actively working with both the institutions’ caregivers (hospitals, CLSCs) and the community. A grassroots organization, AMI-Québec is committed to helping families manage the effects of mental illness through support, education, guidance and advocacy. By promoting understanding, the organization aims to dispel the stigma still surrounding mental illness, thereby helping to create communities that offer new hope for meaningful lives. While Québec government considers AMI-Québec a sub-regional organization (and funding is provided accordingly), the organization has extended its mandate to include assistance to English speaking families throughout the province. It has been instrumental in helping to start up several family associations and continues to provide help as required. From an organization run solely by volunteers, today AMI-Québec engages eight salaried employees and more than one hundred volunteers. Funding provided by the government amounts to less than half the annual operating budget. The balance is raised through continuous fundraising. The monthly support group that existed up to 1990 has expanded to an average of eleven support groups every month. These include various groups for different family member populations as well as diagnoses-based groups. Information sessions and interactive workshops are offered year-round. Individual counseling (SOS-Famille) is available as a complement to the support and education programs. In 1993 AMI-Québec created a satellite group in Brossard, in order to facilitate access to support for off-Island residents. Later on assistance was offered to a second group on the South Shore, as well as to a group in the Estrie region. The latter was incorporated in 2005. Representatives of Mental Health Estrie serve on the AMI-Québec board of directors. In an effort to reach out to young people and demystify mental illness at an early age, in 1997 AMI-Québec introduced a mental illness education program in Montreal high schools. To date close to 45,000 students have attended and benefited from nearly 1,500 presentations. In 2001 AMI-Québec upgraded its website to allow easy access to information, especially for off-Island English-speaking families. In 2005 AMI-Québec introduced a Family Outreach Program at the Allan Memorial Institute. This pilot project aimed at reaching out to families at the beginning of their struggle with mental Illness and providing early support and guidance. To connect with English speaking families living beyond the Island of Montreal, AMI-Québec initiated a Tele-Workshops pilot project in 2006. The goal is to offer guidance and support to isolated families for whom access to English services may be difficult. Seminars and conferences have been organized to increase public awareness and understanding of mental illness. Well recognized is the annual Low-Beer Memorial Lecture, which was introduced in 1994. A collaboration with the psychology department of Concordia University, this lecture attracts an average of 500 attendees each year. In 1999 AMI-Québec initiated Depression Screening Day. Various CLSCs, hospitals, community organizations, CEGEPs and universities have since collaborated on this annual campaign to help demystify depression and other mental illnesses. In 2004 the Day became a week-long awareness campaign. To foster collaboration with healthcare providers, AMI-Québec has organized numerous seminars since the early ‘90s. Seminars have been held with the psychiatry departments of various hospitals as well as with other community organizations and health providers. Share & Care is a quarterly newsletter distributed to members, health professionals and the community. In 1992, AMI-Québec published Mental Illness, A Regional Handbook for Families, in both English and French. The publication was updated in 1993, 1997 and 2003, and is considered an essential guide to the mental health scene in Montreal. In 1998 AMI-Québec published Sharing the Care: Financial and Legal Considerations in Planning for People with Mental Disabilities in Québec. The publication was reprinted in 2001. The organization in 2004 introduced Flowers of Friendship at the psychiatry department of the Montreal General Hospital. Delivering potted flowering plants and a get-well card to newly arrived patients offered support and encouragement and reflected the organization’s commitment to promoting hope, inclusion and recovery. In 2004 AMI-Québec embarked on a strategic planning process. The organization’s mission and vision were reviewed and updated; strengths, weaknesses, opportunities and threats were analyzed. Programs were reviewed and adjustments were made to ensure continued relevance and effectiveness. Board retreats were held to allow for thorough discussion and participation. 20th anniversary celebration: The organization created a ceramic tile mural, now on permanent display at Concordia University (Hingston Hall, Loyola Campus). The work was a collaboration of members, friends and the community, and was supervised by the Art Therapy Programme of Concordia University. 25th anniversary commemoration: AMI-Québec created seven quilts that were presented to various psychiatry departments in Montreal hospitals. Members, friends and the community-at-large participated in the creation of the quilts. In 2004 AMI-Québec presented Dr. Richard Kogan in a fundraising concert, Schumann: Music, Mood Swings and Madness. Both a psychiatrist and a concert pianist, Dr. Kogan demonstrated how the composer’s mental illness influenced his creativity. AMI-Québec is widely considered an expert in its field and is often approached for opinions on mental health issues. AMI has participated in numerous television and radio interviews and in conferences. As well AMI reps have served on, or chaired, numerous professional committees. Several community-based conferences have been initiated by AMI-Québec. Some of AMI’s public presentations have been transcribed in professional journals (Le Partenaire, Vol. 11, No. 1, page 13-14, été 2003). Over the years AMI-Québec created and presented awards to volunteers, professional caregivers and individuals with mental illness, who have excelled in their respective domains. In 2005, AMI-Québec was awarded the Douglas Utting Prize for its “front-line work on every aspect of mental illness”. The prize salutes a person or organization contributing in a major way to the research, treatment and/or promotion of awareness of depression. Four couples get together for self help and support. The group incorporates as ARAFMI: Association of Relatives and Friends of the Mentally Ill.
ARAFMI assists in the formation of AQPAMM, the first French sister-group in Montreal. ARAFMI assists in the formation of resources for ex-psychiatric patients. Club-AMI, a center for people with mental health problems, is sponsored and financially assisted by ARAFMI (later AMI-Québec) during its formative years. ARAFMI changes its name to AMI-Québec Alliance for the Mentally Ill, to reflect its new affiliation with the National Alliance for the Mentally Ill (NAMI) in the U.S.A.
A provincial umbrella organization of family associations is formed, of which AMI-Québec is a founding member. (FFAPAMM: Federation des familles et amis de la personne atteinte de maladie mentale). Sibling and Adult Children network is formed. January: The first paid service coordinator is hired, thanks to a first time grant from the Québec Ministry of Health and Social Services. (Until 1990 the organization operated with volunteers only). Special efforts are made to link up with health professionals, especially in hospitals of Central -West Montreal. 16 meetings are held during the year. May: The first AMI seminar is organized in collaboration with the psychiatry department of the Montreal General Hospital. Entitled Diagnosis: Schizophrenia, it coincides with Mental Health Awareness Week and attracts 200 family members and mental health professionals. February: Moving into a new office in order to accommodate the growing needs and expansion of services. A daytime support group is added to the evening schedule. May: A second AMI seminar is organized in collaboration with the psychiatry department of the Jewish General Hospital. Entitled Mental Illness: Navigating the Storm, the seminar is filled to capacity with 160 family members, health professionals and the public. AMI coordinator is named executive director. September: A second employee, administrative assistant, is hired. January: Mental Illness: A Handbook for families is published in both English and French (10,000 copies in each language), in collaboration with Project ARC. May: The third AMI Seminar entitled Mental Illness: Family Caregivers in the Treatment Team, with the Douglas Hospital, attracts 150 participants. October: Support groups change from monthly to weekly. An education program on depression and bipolar disorder is offered for the first time. Family members assume a growing role in groups’ leadership. January: Moving to a new office. March: A monthly support group for both families and consumers with depression and bipolar disorder is offered for the first time. May: The fourth AMI seminar entitled Breaking Down Barriers: Families and Professionals Working Together, with the Allan Memorial Institute, attracts 150 participants; 46% of whom are family members, 42% are health professionals, and 12% are consumers. June: An Exemplary Psychiatrist Award is presented to Dr. N.P. VaSavan Nair (Douglas Hospital); Dr. Philip Beck (Jewish General Hospital); Dr. Allan Fielding (Allan Memorial Institute). A revised edition of Mental Illness: A Regional Handbook for Families, tailored for Montreal and Laval, is published. August: The newly created Monty Berger Award for Exemplary Service is presented to May Gruman, founder of AMI-Québec. September: A part-time networking coordinator is hired. An education program on obsessive compulsive disorder is offered for the first time. A new support group is set up on the South Shore in collaboration with CLSC Samuel de Champlain. E. Fuller Torrey, MD, (NIMH, Washington D.C.) presents Care of Individuals with Mental Illness: How to Avoid America’s Mistakes, to an audience of 500. This is a joint collaboration of AMI-Québec and the psychiatry department of McGill University, marking the department’s 50th anniversary. January: An education program for spouses is offered for the first time. February: A press conference is organized to protest the changes introduced to the court order procedure for a psychiatric examination. May: The fifth AMI seminar entitled Mental Illness; Partners in-Care, with St. Mary’s Hospital department of psychiatry, attracts 170 participants. June: An Exemplary Psychiatrist Award is presented to Dr. Joyce Boillat (Douglas Hospital); Dr. David Bloom (Douglas Hospital); Dr. James Farquhar (Montreal General Hospital). August: The Monty Berger Award for Exemplary Service is presented to Martha Bishop. September: Patricia Backlar (Oregon, USA) delivers the first John Hans Low-Beer Memorial Lecture to an audience of 400. A collaboration with Concordia University’s Department of Psychology. October: An education program on schizophrenia is offered for the first time. May: The sixth AMI seminar entitled Just in Case: Consumers, families, professionals and the community planning together to cope with an anticipated crisis, is offered in collaboration with the Montreal General Hospital’s department of psychiatry, to a full house of 200 participants. June: An Exemplary Psychiatrist Award is presented to Dr. Gilbert Pinard (McGill University), Dr. Henry Olders (Douglas Hospital) and Dr. Warren Steiner (Montreal General Hospital). The Monty Berger Award for Exemplary Service is presented to Monica Reznick. The newly created AMI-Québec Award for Exemplary Service in the Field of Mental Illness is presented to Shulamith Hausman and Muriel Pater. Kay Simpson is selected as the AMI-Québec Volunteer of the Year. Marylin Block, Sylvia Klein, Evelyn Ortenberg, Michael Ortenberg and Anita Miller are selected for special volunteer recognition. September: Fred Frese, PhD (Ohio, USA) delivers the second John Hans Low Beer Memorial Lecture to an audience of 400. A collaboration with Concordia University’s Department of Psychology. October: A workshop for consumers, facilitated by consumers, is offered for the first time. May: The seventh AMI seminar: Who Cares…? Changing Directions in Mental Health Care Delivery is organized with the Jewish General Hospital department of psychiatry. 150 participants. AMI-Québec is a partner in a seminar entitled Community-based Treatment for the Mentally Ill: Making it Work. 500 participate in the seminar that focuses on innovative approaches to psychiatric treatment. June: An Exemplary Psychiatrist Award is presented to Dr. Richard Monks (Montreal General Hospital); Dr. Michel Messier (Douglas Hospital); Dr.Pierre Lalonde (Louis H. Lafontaine Hospital). The Monty Berger Award for Exemplary Service is presented to Sylvia Klein. The AMI-Québec Award for Exemplary Service in the Field of Mental Illness is presented to Christopher MacFadden. Pieter Boudens is selected as the AMI-Québec Volunteer of the Year. Doug Richardson, Elsie Richardson, Joanne Smith, Shirley Smith and Sylvia Silver are selected for special volunteer recognition. September: Peter Weiden, MD (New York, USA), delivers The third John Hans Low-Beer Memorial Lecture to an audience of 400. In collaboration with Concordia University Department of Psychology. November: Office expansion: Adding 260 square feet to the existing space, now totaling 1336 square feet. AMI-Québec marks its twentieth anniversary with an organizational restructuring and expansion. The new structure comprises of an executive director, administrative assistant, membership and program coordinator, networking coordinator, and high-school education coordinator. The new high school education program aims at expanding AMI’s education outreach to high school students and administrators. By the end of the first year, 59 presentations are made in 23 schools across Montreal, to more than 1400 students. May: Penny Lang in concert, marking AMI-Québec’s 20th Anniversary. June: Twentieth Anniversary Annual General Meeting. Unveiling of a ceramic-tile mural that was designed, developed, and executed by AMI members and friends, in celebration of its 20th anniversary. The Art Therapy Programme of Concordia University supervised the project and the mural was installed at the University’s Loyola Campus for permanent display. Third edition of Mental Illness: A Regional Handbook for Families is published. Awards and recognitions are presented to the following individuals: Kay Simpson (The Monty Berger Award for Exemplary Service); Elva Crawford (The AMI-Québec Award for Exemplary Service in the Field of Mental Illness); Dr. Alain Lesage and Dr. Paul Beaudry (The Exemplary Psychiatrist Award); Carlos Martinez (The AMI-Québec Volunteer of the Year); Duncan Foster, Hélène Tétrault and Juliette Toth are selected for special volunteer recognition. Patrice Pinard, Dr. Ron Harris and the Cognitive Therapy Unit, Douglas Hospital; Irene Ranti; Zelda Levine, Leland Peterson, Anne-Marie Lévesque (Certificate of Merit). Edith Low Beer, President of the EJLB Foundation, receives a special recognition for the Foundation’s continuous support of AMI-Québec. September: Jill Bolte Taylor, PhD (Massachusetts, USA) delivers the fourth John Hans Low-Beer Memorial lecture, to an audience of 400, in collaboration with Concordia University Department of Psychology. May: A seminar entitled Community-based Treatment for the Mentally Ill, 1998: New Beginnings, New Partners is organized by AMI-Québec in collaboration with hospitals, CLSCs and Centre-West community organizations. Planned to address the changes in psychiatric services, it attracts 250 consumers, health professionals and families. It also marks the first collaboration of its kind between service providers in Central-west Montreal. June: Awards and recognitions are presented to the following individuals: Beppie Boudens (The Monty Berger Award for Exemplary Service); Donald Carette and Ura Greenbaum (The AMI-Québec Award for Exemplary Service in the Field of Mental Illness); Dr. Mimi Israel (The Exemplary Psychiatrist Award); Robert Daoust (The AMI-Québec Volunteer of the Year). Robert Thomas, John Jones, Queenie Grosz and Rosanne Baatz are selected for special volunteer recognition. Certificates of Merit are presented to Dr. Craig Emes and Bryna Feingold. September: Lili C. Kopala, MD (Halifax, Nova Scotia) delivers the fifth John Hans Low-Beer Memorial lecture to an audience of 400, in collaboration with Concordia University Department of Psychology. A consumers-only self help group is established. Open to consumers with any diagnosis, it is run by consumers and offered monthly. Sharing the Care: Financial and Legal Considerations in Planning for People with Mental Disabilities, is published in collaboration with maître Marilyn Piccini Roy. The AMI-Québec Library Memorial Library Fund is created. While serving to memorialize friends in a tangible and long lasting way, the fund helps to expand AMI’s education and outreach program through the donation of books on mental illness to public libraries. June: Awards and recognitions are presented to the following individuals: Elizabeth Tremain (The Monty Berger Award for Exemplary Service); Dr. Paul Lefort (The AMI-Québec Award for Exemplary Service in the Field of Mental Illness); Dr. Floriana Ianni and Dr. Marc Laporta (The Exemplary Psychiatrist Award); Sylvia Silver (The AMI-Québec Volunteer of the Year). Valerie Gold, Olha Charko and Sylvie Albert are selected for special volunteer recognition. Certificate of Merit is presented to lawyer Marilyn Piccini-Roy. Special recognition is made, posthumously, to Dr. Heinz Lehman. At the end of the second year of AMI’s education program in high schools, 112 presentations are made at 24 schools. More than 3,300 students benefited. Office is expanded and now holds 1640 square feet, including a newly created Net Nook for internet access. September: Bill Lichtenstein (New York) delivers the sixth John Hans Low-Beer memorial lecture to an audience of 500, in collaboration with Concordia University. October: The first large scale depression screening day in Quebec is initiated by AMI-Québec and carried out in collaboration with healthcare providers in Montreal West-end. Six sites are open to the public and 516 people visited. June: Awards and recognitions are presented to the following individuals: Pieter Boudens (The Monty Berger Award for Exemplary Service); Nancy Houlahan (The AMI-Québec Award for Exemplary Service in the Field of Mental Illness); Dr. Brian Greenfield (The Exemplary Psychiatrist Award); Rachel Hoffman (The AMI-Québec Volunteer of the Year). Bob Cox, Beatrice Thériault and Magda Grzechowiak are selected for special volunteer recognition. Certificates of Merit are presented to Denise Morin, Kieran O’Connor, Mark Freeston, John Parker and André Leclerc. At the end of the third year of AMI’s education program in high schools, 191 presentations are made at Montreal high schools, 12 are visited for the first time. 5757 students have attended presentations. September: Gail Steketee, PhD (Boston University of Social Work) is the keynote speaker at the seventh John Hans Low-Beer Memorial lecture to a full house of some 500 people. A collaboration with Concordia University Department of Psychology. October: The second depression screening day in Quebec is organized by AMI, in collaboration with healthcare providers in the Montreal West end, as well as two CEGEPs and one university. 1574 persons attended nine sites. 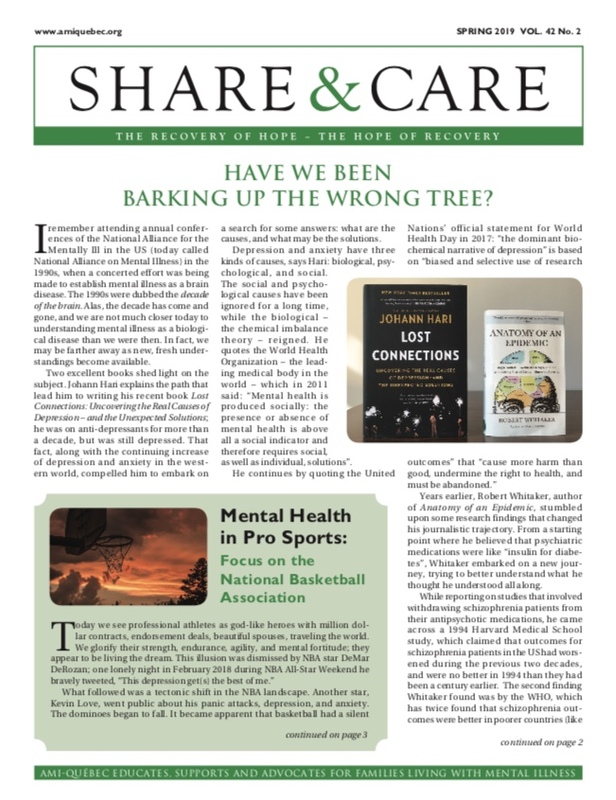 April: Second edition of Sharing the Care: Financial and Legal Considerations in Planning for People with Mental Disabilities, is published. June: Awards and recognitions are presented to the following individuals: Lorna Moscovitch (The Monty Berger Award for Exemplary Service); George Bastien (The AMI-Québec Award for Exemplary Service in the Field of Mental Illness); Dr. Thomas Kolivakis (The Exemplary Psychiatrist Award); Thelma Wolfe (The AMI-Québec Volunteer of the Year). Judy & Lynn Ross; Tom & Linda Ransom are selected for special volunteer recognition. Certificates of Merit are presented to Moira Edwards, the Advocacy Committee, and the South Shore support group. At the end of its fourth year, AMI’s high school education program was presented in all the English Montreal School Board high schools and the Riverdale School Board on the South Shore. 315 presentations were made in 53 high schools and close to 10,000 students benefited. 130 teachers participated in three workshops. October: Martha Manning, PhD (Arlington, Virginia) is the keynote speaker at the 8th John Hans Low Beer Memorial Lecture to a full house of some 500 people. The lecture was organized in collaboration with the Department of Psychology, Concordia University. The third depression screening day in Quebec is organized by AMI, in collaboration with healthcare providers in Montreal’s West-End, and five cegeps and universities. More than 5,000 people visited eleven sites. June: Awards and recognitions are presented to the following individuals: Claudia Ikeman (The Monty Berger Award for Exemplary Service); Ivan Drouin (The AMI-Québec Award for Exemplary Service in the Field of Mental Illness); Dr. Marie-Carmen Plante (The Exemplary Psychiatrist Award); Al Winslow (The AMI-Québec Volunteer of the Year). Gail Adams and Joan Krajdl are selected for special volunteer recognition. Certificate of Merit is presented to Abe Weiss. September: Fred Frese, PhD (Ohio) is the keynote speaker at the 9th John Hans Low Beer Memorial. 650 in attendance. A collaboration with the Department of Psychology, Concordia University. Fourth Depression Screening Day; 15 partners (5 CLSCs, 6 cegeps / universities, 4 others); 29 sites. Close to 5,000 visits, 880 filled questionnaires. November: AMI celebrates its 25th anniversary with the slogan “The Recovery of Hope, the Hope of Recovery”. Hanging quilts, the result of a year-long community undertaking, are presented to local hospitals and community organizations. A gala celebration with a children’s choir, display of quilts, and a video presentation of the organization’s life throughout the years, takes place at Concordia University’s Oscar Peterson Concert Hall. The fourth edition of Mental Illness: A Regional Handbook for Families is launched during the celebration. June: Awards and recognitions are presented to the following individuals: Nancy Grayson (The Monty Berger Award for Exemplary Service); Bernie Digiglio (The AMI-Québec Award for Exemplary Service in the Field of Mental Illness); Dr. Charles Cahn (The Exemplary Psychiatrist Award); Sylvie Albert (The AMI-Québec Volunteer of the Year). Wendy Potofsky, Vicki Atkinson and Anita Barskey are presented with special volunteer recognition certificates. Air Canada employees and retirees are recognized for their generous contributions over the past five years. September: Scott Simmie and Julia Nunes are the keynote speakers at the 10th anniversary of the John Hans Low Beer Memorial. More than 500 in attendance. A collaboration with the Department of Psychology, Concordia University. Fifth Depression Screening Day; 13 partners (5 CLSCs, 5 cegeps / universities, 3 others); 22 sites. 3,720 visits, 740 filled questionnaires. March-April: AMI embarks on a first ever strategic Planning process, aimed at recognizing the organization’s accomplishments and reaffirming its strengths, while reviewing its mission and vision for the coming years. June: Advisory Board is formed, allowing the organization to benefit from the expertise and experience of individuals who are unable to be extensively involved on a regular basis. Awards and recognition are presented to the following individuals: Gary Furlong(The Monty Berger Award for Exemplary Service); Jill Cady(The AMI-Québec Award for Exemplary Service in the Field of Mental Illness); Dr. Ghislain Savard(The Exemplary Psychiatrist Award); Giovanna Donnini(The AMI-Québec Volunteer of the Year). Brenda Shaffer is presented with a special volunteer recognition certificate. Flowers of Friendship, a pilot project under which newly arriving psychiatric patients at the Montreal General Hospital were presented with a potted flowering plant and a get-well card from AMI. This project reflects AMI’s commitment to creating communities that offer new hope for meaningful lives. November: Amy K. Long, a U.S. activist and educator who had received several psychiatric diagnoses years earlier, presented Secret Weapon: It’s in our power to survive mental illness. Organized with the psychology Department of Concordia University, the event attracted some 500 participants. Do You See What I See? Visions For Shaping Mental Healthcare was a conference organized by the Table de concertation en santé mentale Centre-ouest, on which AMI-Québec is represented. A first of its kind, the conference reviewed various visions of care and challenged the thinking behind current practices. January: Introducing SOS-Famille, a short-term intervention program for individual families requiring assistance with an acute problem. While resolving a crisis, the program, complementing AMI’s traditional support and education, is aimed at working towards long-term solutions. June: First-ever fundraising event, featuring Dr. Richard Kogan, a psychiatrist and concert pianist. Dr. Kogan presented Schumann: Music, Mood swings and Madness, demonstrating how the composer’s mental state had affected his creativity. Awards and recognition are presented to the following individuals: Paul Rubin (The Monty Berger Award for Exemplary Service); Michael Arruda (The AMI-Québec Award for Exemplary Service in the Field of Mental Illness); Dr. Ashok Malla (The Exemplary Psychiatrist Award); Robert Daoust (The AMI-Québec Volunteer of the Year); Loise Forest (The AMI-Québec Extra Mile Award). August: To accommodate the growing programs and staff, the office is relocated to a bigger space on the second floor of same office building, now holding 2469 sq.ft. (50% space increase). September: Picking Up The Pieces: After Mental Illness and Other Traumas is Richard Tedeschi, PhD’s presentation at the Low-Beer Memorial Lecture. Organized with the Psychology Department of Concordia University, it attracts some 500 participants. October: Family Outreach Program is introduced at the Allan Memorial Institute. An AMI worker in the hospital offers support and guidance to families. November: AMI-Québec is the recipient of the 2005 Douglas Utting Prize. Praised as “a front line organization that has worked on every aspect of mental illness”, AMI is the first organization to be awarded this prize. Second Board retreat focusing on Board’s roles and responsibilities. June: Awards and recognition are presented to the following individuals: Moira Edwards (The Monty Berger Award for Exemplary Service); Therese Wallace (The AMI-Québec Award for Exemplary Service in the Field of Mental Illness); Dr. karine Igartua and Dr. Richard Montoro (The Exemplary Psychiatrist Award); Beatrice Theriault (The AMI-Québec Volunteer of the Year); Forward House (The AMI-Québec Extra Mile Award). September: The Low-Beer Memorial Lecture with Larry Davidson, PhD – Re-inventing Mental Illness: the revolution that promises to change everything. Organized with the Psychology Department of Concordia University, it attracts some 500 participants. A conference for health professionals: Recovery and Clinical Practice was organized on the same day in collaboration with l’AQRP, and attracted more than 400 professionals. September: A series of six tele-workshops was launched, aimed at facilitating access to information, especially for families living in regions where access to English services is difficult. The response was overwhelmingly positive. June: Second fundraising event, featuring Dr. Richard Kogan, a psychiatrist and concert pianist. Dr. Kogan presented Inspired by Depression: Tchaikovsky’s Dark Genius, demonstrating how the composer’s mental state had affected his creativity. June: Awards are presented to the following individuals: Bryna Feingold (The Monty Berger Award for Exemplary Service); Eleanor Beatti (The AMI-Québec Award for Exemplary Service in the Field of Mental Illness); Dr. Suzanne Lamarre (The Exemplary Psychiatrist Award); Connie Di Nardo and David Moscovitch (The AMI-Québec Volunteer of the Year); Sylvie Albert (The AMI-Québec Extra Mile Award). September: The Low-Beer Memorial Lecture with Patrick Corrigan: Don’t Call Me Nuts: Why we stigmatize mental illness; Organized with the Psychology Department of Concordia University, it attracts some 500 participants. September: AMI-Quebec’s Executive Director is invited to chair the Family Caregivers Advisory Committee of the newly created Mental Health Commission of Canada. June: Awards are presented to the following individuals: Al Winslow (The Monty Berger Award for Exemplary Service); Stella Lacoursiere (The AMI-Québec Award for Exemplary Service in the Field of Mental Illness); Dr. Gustavo Turecki (The Exemplary Psychiatrist Award); Carol Vandette (The AMI-Québec Volunteer of the Year); Catherine Gilbert (The AMI-Québec Extra Mile Award). September: The Low-Beer Memorial Lecture with Michael Kirby, Chair of the Mental Health Commission of Canada: What Took So Long? The blood, sweat and tears behind the launch of the Mental Health Commission of Canada. October: The third fundraising concert featuring Oliver Jones and Ranee Lee in a tribute to Oscar Peterson. June: Awards are presented to the following individuals: Joanne Smith (The Monty Berger Award for Exemplary Service); St. Mary’s Hospital Department of Psychiatry (The AMI-Québec Award for Exemplary Service in the Field of Mental Illness); Dr. Nadia Szkrumelak (The Exemplary Psychiatrist Award); Sara Fleischman, Hugo Jimenez (The AMI-Québec Volunteer of the Year); Elizabeth Glutch (The AMI-Québec Extra Mile Award); Heidi Berger (Special Recognition). The Hidden Victims of Mental Illness – a 12-minute video focusing on the experience of family caregivers is produced and launched. September: Canada Post Foundation for Mental Illness and Mental Health approved a one-year grant in support of AMI-Quebec Tele-workshop Project. October: The Low-Beer Memorial Lecture with Charles Barber: An Unexpected Gift: How mental illness enriched my life. October: The fourth fundraising concert featuring the Jubilation Gospel Choir. January: FRIENDS for Life, a resilience-building program that helps to prevent anxiety and depression in children and youth is spearheaded by AMI-Quebec in collaboration with the English Montreal School Board and the East-Island Network for English-Language Services (REISA). The program is piloted in two east-end schools; 36 teachers and other professionals receive training and 370 children benefit in Phase I.
April: Aimed at reducing stigma around mental illness and spreading a message of hope and empowerment, Stand Up for Mental Health was introduced in Montreal as a partnership with Vancouver-based counselor and stand-up comic David Granirer. Ten individuals with mental health challenges attended the Skype-based training program that culminated in three performances, one of them at the Montreal Fringe Festival. June: Awards are presented to the following individuals: Jean Claude Benitah (The Monty Berger Award for Exemplary Service); Judy and Lynn Ross (The AMI-Québec Award for Exemplary Service in the Field of Mental Illness); Dr. Fiore Lalla, Dr. Samarthji Lal; (The Exemplary Psychiatrist Award);Sharleen Young, Karen Waxman(The AMI-Québec Volunteer of the Year); Sherry Ellen (The AMI-Québec Extra Mile Award). September: Canada Post Foundation for Mental Illness and Mental Health approved a second, one-year grant, in support of the AMI-Quebec Tele-workshop Project. October: A fundraising event sponsored by Avanti is organized. The Low Beer Memorial Lecture, re-named to commemorate both John and Edith Low Beer, is presented, featuring Jijian Voronka and Sonia Coté in a presentation entitled: Living Homeless: My Learning from Street Life. March: AMI moves into a new office, providing an opportunity for growth and expansion. May: The fifth major fundraising event is organized, with Howie Mandel on stage. June: Awards are presented to the following individuals: Rénée Griffiths (The Monty Berger Award for Exemplary Service); Gillian Bowen (The AMI-Québec Award for Exemplary Service in the Field of Mental Illness); Dr. Simon Amar (The Exemplary Psychiatrist Award);Lise Bluteau, Laura Easty (The AMI-Québec Volunteer of the Year); Joyce Cohen (The AMI-Québec Extra Mile Award). The John and Edith Low Beer Memorial Lecture featuring Robert Whitaker in a presentation titled: Doing More Harm than Good? Time to revisit the use of psychiatric drugs. November: Open House as a welcome to our new office. Our cookbook Food For Every Mood is launched. June: AMI marks its 35th anniversary with two events: Annual General Meeting honouring founding members and past presidents, and a fundraising Gala. October: The John and Edith Low Beer Memorial Lecture featuring Dr. David Goldbloom in a presentation titled Where madness meets art – Mental illness and the creative mind. October: AMI receives a grant in support of our outreach programs from Bell Canada Let’s Talk Community Fund. January: Special event for siblings and adult children is organized. January: A first Borderline Personality Disorder program for caregivers is offered. June: Awards are presented to the following individuals: Annie Young (The Monty Berger Award for Exemplary Service); Reuven Feldman (The AMI-Québec Award for Exemplary Service in the Field of Mental Illness; Miriam Byers, Barbara Sheiner (The AMI-Québec Volunteer of the Year); Lynn Nulman (The AMI-Québec Extra Mile Award); Louis Béland (Special recognition). June: Fundraising event with Michael Landsberg and Stéphane Richer. November: The John and Edith Low Beer Memorial Lecture featuring Dr. Xavier Amador in a presentation titled I am not sick I don’t need help! Winning on the strength of your relationship, not your argument. April: Art for Charity fundraising event is organized. June: Awards are presented to the following individuals: Francine Waters (The Monty Berger Award for Exemplary Service); Tom Caplan (The AMI-Québec Award for Exemplary Service in the Field of Mental Illness); Dr. Gérard Pierre Louis, Dr. Luis Vacaflor (The Exemplary Psychiatrist Award); Sophie Glorieux, Bob Harris (The AMI-Québec Extra Mile Award); Brenda Cormier (The Volunteer of the Year Award). June: The Young Adult Group organized the InVisible Full Moon Party to fight stigma. October: The John and Edith Low Beer Memorial Lecture featuring Stéphane Grenier in a presentation titled: The Sweetest Victory: How his battle with PTSD changed a soldier into a champion for peer support. April: AMI-Quebec buys a property that will become a permanent home for the organization upon occupation in early 2016. May: Open Mike Night, a fundraising event with comedian Mike MacDonald. June: Awards are presented to the following individuals: Elva Crawford (The Monty Berger Award for Exemplary Service); Jean Enright, Jim Carter (The AMI-Québec Award for Exemplary Service in the Field of Mental Illness); Dr. Tewfik Said (The Exemplary Psychiatrist Award); Colin Coole (The AMI-Québec Extra Mile Award); Martin Zidulka (The Volunteer of the Year Award). April 1: AMI-Quebec moves into their new, permanent home at 5800 Decarie. June: Awards are presented to the following individuals: Alan Payne (AMI-Quebec Volunteer of the Year); Dr. Judy Glass and Dr. Karl Looper (Exemplary Psychiatrist Award); Diana Verrall (The Extra Mile Award); Gail Adams (AMI-Québec Award for Exemplary Service in the Field of Mental Illness); Dr. Stephen Snow (Ella Amir Award for Innovations in Mental Health). October: “Family Matters”, a fundraising event with Howie and Alex Mandel. The John and Edith Low Beer Memorial Lecture featuring Dr. Dolores Malaspina on “The Nature-Nurture Puzzle: Risk and Protective Factors in Mental Illness”. AMI-Quebec helps families manage the effects of mental illness through support, education, guidance, and advocacy. Our programs are free! Events - AMI-Quebec amiquebec.org	Keep an eye on this page for our upcoming events, including our annual Low-Beer lecture, Montreal Walks for Mental Health, and fundraising activities.